Fahrenheit is a less-than-major Image Comics character. 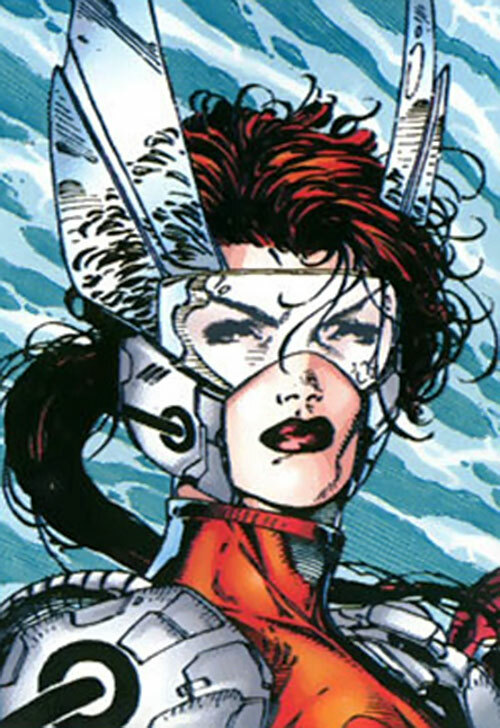 She appeared early on in StormWatch, in 1993. She’s a relatively generic heroine with fire powers – at least early on. For context, you may want to read the StormWatch organisation profile first. This profile is split into three parts. Not because it’s particularly long, but because the parts correspond to eras with different power levels, costumes, roles and characterisations. Fahrenheit profile #1 – agent of StormWatch. Fahrenheit profile #2 – StormWatch Red leader. Fahrenheit profile #3 – the StormWatch PHD project. Known Relatives: Tara (sister, deceased), Peter (father, deceased). Group Affiliation: StormWatch Two, then StormWatch One. Height: 5’9” Weight: 131 lbs. Fahrenheit is a seedling . Her powers enable her to agitate the molecules in objects, quickly heating them like a microwave oven. When used on combustible materials, they burst into flames. When using it on the air surrounding her, she can create and control updrafts strong enough to let her fly at formidable speeds. Fahrenheit can both invisibly heat items (such as guns) and project large, very visible streams of flame. Her flame is hot enough to melt and mostly vaporize bullets. She eventually learned how to lay streams of flame in front of her when fired upon. In joining StormWatch, she also underwent extensive combat training (with Backlash serving as her instructor) to get a solid level of hand to hand fighting skill. Like many (most ?) Seedlings in the WildStorm universe, she has a remarkable physical constitution for a person of her size and weight. Lauren’s latent powers were revealed when she was a young adult. She found herself trapped in a burning building, which was reduced to ash and cinders. When firefighters combed through the wreckage, they found her unconscious but otherwise unhurt. Hearing of her miraculous survival, Synergy tracked her down and activated her powers. After undergoing the rigorous training required of a StormWatch operative, Lauren was offered a position in StormWatch Two, the reserve team. Her first documented mission with StormWatch Two was a disaster. They investigated the intrusion of the powerful extradimensional lord Regent in the ruins of Chernobyl, but were ambushed and slaughtered. Mission leader Cannon had to flee. Fahrenheit and Winter survived, but team members Ion and Lancer were killed. StormWatch One and Winter eventually defeated Regent. Fahrenheit was not seen for a while, presumably spending time to heal her wounds and train so she could graduate to the main team. Meanwhile, the more powerful and better-trained Winter joined said main team almost immediately. Synergy (Christine Trelane) then became the new Weatherman – the commander of the StormWatch organisation for the Security Council. She assembled a team led by Winter and composed of Cannon, Strafe and Fahrenheit. The mission was to inspect a Red Army base in Siberia, which had just gone offline under obviously violent circumstances. Once again, the team was quickly taken apart by the armoured M.A.D.-1. Lauren told Winter to leave her wounded in the rubble and confront the villain. Winter eventually prevailed. After Siberia, Fahrenheit started being deployed more regularly with the rest of the team. Synergy eventually made Lauren an official part of StormWatch One. Pennington was sent to Rwanda. During the mission she rescued a tween, Mayinga, and arranged for the girl to be taken care of by UN services. Lauren apparently played the role of the big sister toward Mayinga for much of her career with StormWatch, helping her recover from her trauma in her homeland. Fahrenheit was with the team that fought Maul in Hawaii. She later helped confront the WildC.A.T.S. before the big plot by Helspont and Lord Defile to retrieve the crashed Kherubim ship in Nicaragua was revealed. Once the truth was known, StormWatch allied with the Cats to fight the Daemonites. 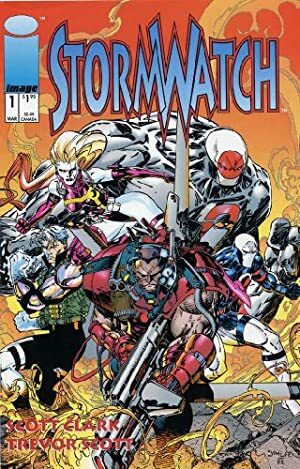 During the crisis the powerful, uncontrollable villains of the Warguard were freed from suspended animation on SkyWatch, the StormWatch satellite. They had been kept there as a last-ditch weapon against the Daemonites. The Warguard soon took control of SkyWatch, slaughtering many of the personnel and ambushing StormWatch when they got back. StormWatch was saved by Spartan, their newest member, though they had to abandon the satellite at the hands of the Warguard. Synergy crashed SkyWatch on Earth in an attempt to destroy the Warguard. But they escaped and were beating StormWatch until StormWatch’s old leader, Battalion, came back and defeated the Warguard. By that point, Fahrenheit was a mainstay with the leading StormWatch team. She was sent to Iraq to fight local super-group Heaven’s Fist, who had hijacked nuclear weapons and killed several trainees of the new StormWatch Two. This mission eventually took the team to Yugoslavia and then France to prevent Heaven’s Fist from detonating their nukes. Along with the rest of StormWatch, an increasingly professional Fahrenheit fought other superheroes during the incomprehensible Fire from Heaven crossover. After Henry Bendix resumed his position as Weatherman, Pennington was promoted to lead her own team – StormWatch Red. The uniforms are illustrated in chronological order. Initially, Fahrenheit had about as much personality as the rest of the team — that is, none. She was inexperienced and not very assured. She nearly gave up when Ion and Lancer died, but seeing Winter and the rest struggle against Regent inspired her. Thus she became determined to try her best to stop villains or die trying. She more clearly considered her life expendable in the name of the greater good. Pennington tended to make rookie mistakes and fight too eagerly to protect others, but that gradually went away. An interesting possibility would be that the Guardians only existed in the 1970’s, and that StormWatch is a newer incarnation of that team, replacing the JLI as the UN-sponsored team. “Rabbit ears” Visor [BODY 02, Shade: 02, Radio communications: 06]. During her very first appearance in Chernobyl, she had one less AP of SPI and but 020 HPs. Her HPs slowly increased over time ; by the end of that era she has 040 HPs. Her Uncertainty may manifest as rookie mistakes — usually getting too close to her opponent (GM’s call) — rather than freezing. I’ve assumed she always had the Regeneration, high BODY and Cold Immunity she displayed in StormWatch PHD, even though none of that was seen in prior appearances. By Nicolas Lemaçon and Sébastien Andrivet. Source of Character: Wildstorm Universe. Helper(s): Philip John Mason, Roy Cowan.